The T-Roc came last year to complement the whole small SUV craze on the market. A bit late for Volkswagen, as the German manufacturer’s huge lineup serves to meet the needs in literally every segment. However, it was well worth the wait! Our Volkswagen T-Roc tuning for the latest 1.5 TSI engine (EA211) brings the T-Roc to a whole new level. The wonderful, completely new 1.5 TSI has two states of tune, as is common with engines nowadays – 130 hp and 150 hp. However, what is not common is that this is one of the most advanced small engines on the market today. First of all, it is the first mass-market small petrol engine with a variable geometry turbo. Other advanced features for this class include 350 bar injectors and electronically operated cooling for controlling temperatures in all conditions. This is very important for small turbocharged engines which extract a lot of power from small displacements. It also becomes even more important for tuning. And this was the version in the lower state of tune, the 130 hp one. The 1.5 TSI (EA211) in the higher, 150 hp output version is even more advanced with atmospheric plasma spray coating, charge air cooling a special exhaust manifold that has thermodynamic perks. These advancements improve fuel efficiency and the overall performance of the engine, thus adding more potential for tuning. This is why we loved it when we saw that we got a project that included the higher output 2018 1.5 TSI VW T-Roc tuning. We have developed a tuning box that makes use of the added potential of the more powerful version of the 1.5 TSI. Our meticulous testing procedure ensures that the added power is completely safe for the engine, either of the available gearboxes and all other parts. The tuning box is very easy to install and it requires no hardware changes. The changes you will experience include more power and torque, as well as a more immediate throttle response. The power increase comes from a change in turbo pressure and fuel delivery. The variable geometry turbocharger enables us to adjust the turbo pressure through a software tweak. This results in more air being sent into the engine. Air and fuel ratio in the combustion chamber needs to be at the same level as before, so the increase in the amount of air also calls for an increase in the amount of fuel sent into the engine. This is another software adjustment. After these two adjustments, the engine has both more air and fuel and this means that it has more power. However, the throttle response improvement does not come just from the extra push. It comes from a change in ignition timing which is advanced to make the combustion start sooner. This results in next to instant response from the engine to every pedal push. Combined with the added power, the feeling behind the wheel is a lot better after our T-Roc tuning. 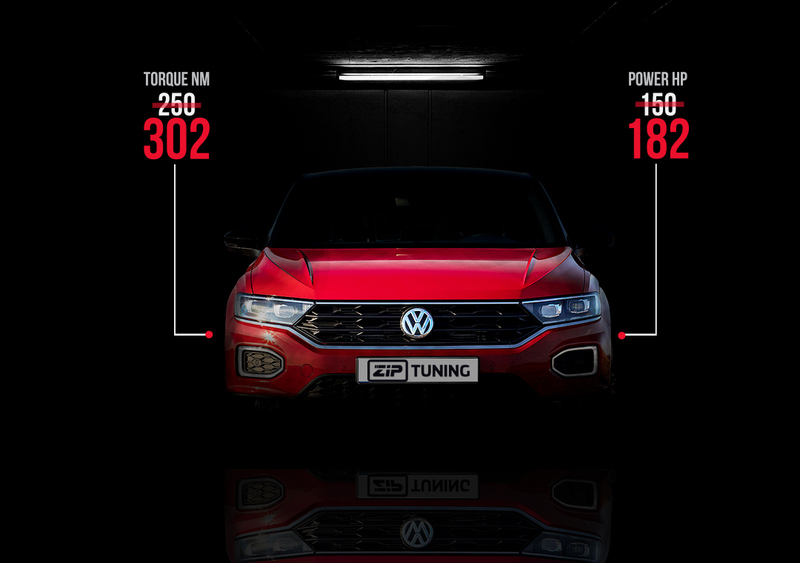 The result of our T-Roc tuning is 182 hp and 302 Nm of torque. All these adjustments are carefully monitored and measured to ensure that no safety limit is exceeded. Safety and reliability is as important as performance gains. Moreover, the tuning box follows the OEM software architecture. 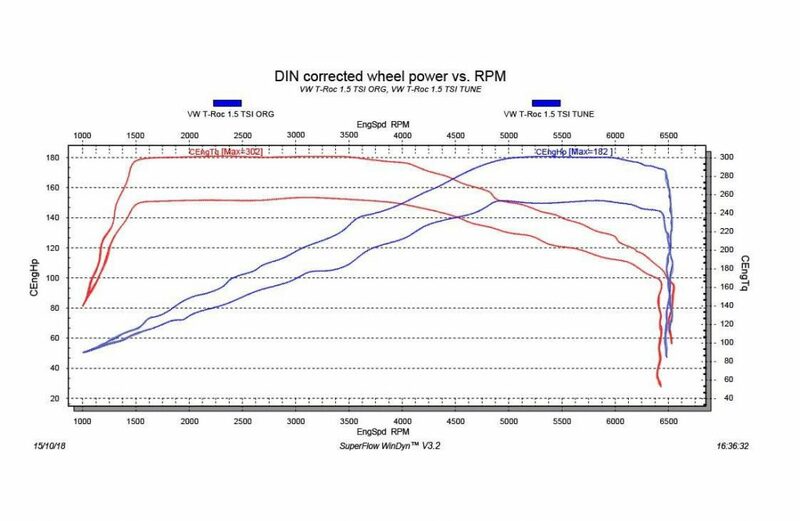 This means that the power and torque curves resemble the OEM ones in shape, but differ in level. You get similar smoothness of the power delivery, but improved by the added push and more immediate throttle response. More importantly, this means that the emissions rating is not affected by the tuning box. You get the same emissions, but far more power. These changes complete our Stage 1 2018 1.5 TSI VW T-Roc tuning. Our special tuning box enables us to include all of these adjustments in a small device that you connect with ease and instantly enjoy the benefits. The same engine is available in several other latest Volkswagen models and seeing how advanced it is it seems that it is here to stay. If you own a different Volkswagen, or would like to learn more about our tuning boxes or more elaborate tuning projects, feel free to browse our website.